Good morning, lovely ones! As I write this, Sam and I are wandering across the southern United States. We're Georgia bound, for his wonderful uncle's 60th birthday and a weekend of family revelry. Consequently, we're also missing the USA v. Germany match. Yes, there were heartbroken wails, when we realized this fact last week. Such are the sacrifices we make for beloved family members! We are not entirely unpatriotic, however. My phone is synced to a radio broadcast of the match and we're both decked out in red, white, and blue road trip attire. Sam is in the official USA kit and I...well, I'm wearing the most ridiculous shorts ever owned by a Mary. 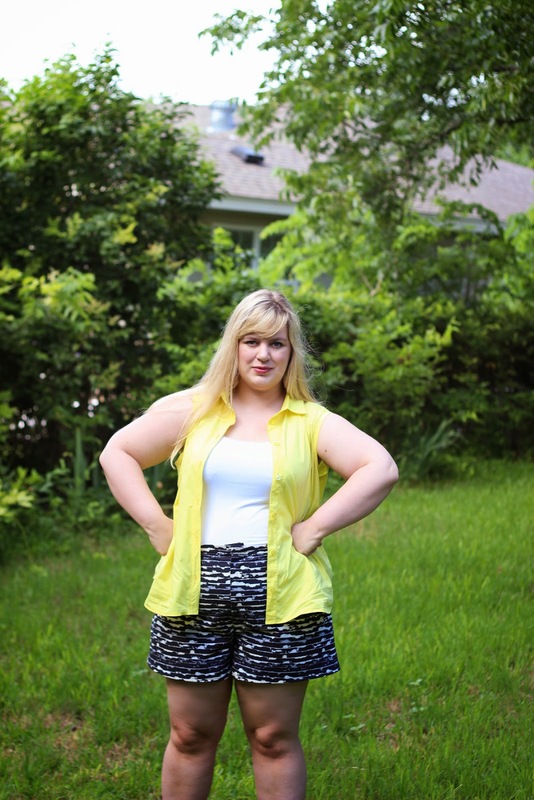 These are the Taylor Shorts, by Greenstyle Patterns, and the Hip Hop Tank by Love Notions. After the rousing success of my Katy & Laney Tap shorts, I was eager to try my hand at some other styles. 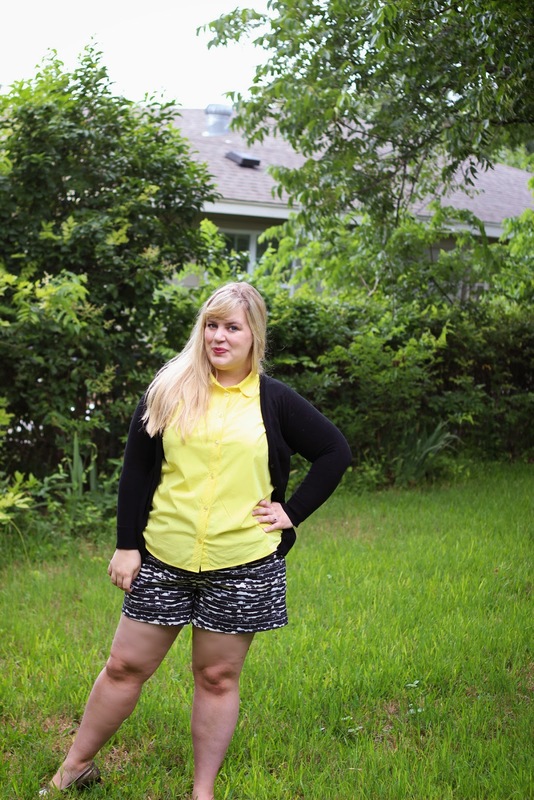 When Robin, of Pattern Revolution, asked if I'd try any of this sale's bundled patterns, I jumped on this cute pair of shorts and awesome blouse. Shorts are only part of my wardrobe during hot weather, but it is brutally hot here until October! An easy, modern pair of shorts sounded just perfect. Unlike the retro silhouette of the Tap Shorts, the Taylor pattern features a low rise waist and three inseam lengths. It has a traditional zip fly, faced pockets (! ), and a darted back. Since the rise is pretty low, you're directed to choose your size based on hip measurement. For me, this translated to something between a 12 and a 14. Which means, of course, that I made a size 16. When it comes to my lower half, I am never convinced by stated measurements. This may be from a particularly traumatic experience with Colette's Ginger skirt or just a desire for more than the standard ease. Part of the reason I love dresses is that they don't constrict my rump party. So, yeah, I refused to believe I was a smaller size and cut a 16. This was ill-advised, y'all. When I tried on the muslin, they were ginormous! I ended up sizing down to a fourteen in the hips and a twelve at the waist. PSA of the day: trust your measurements! As fabric, I used this red-and-white anchor print cotton canvas from Hancock fabrics. A Hancock just opened in Waco on June 14th and I've already been there six times, including one post-dinner trip to buy this fabric because it was haunting me, demanding to be nautical shorts. 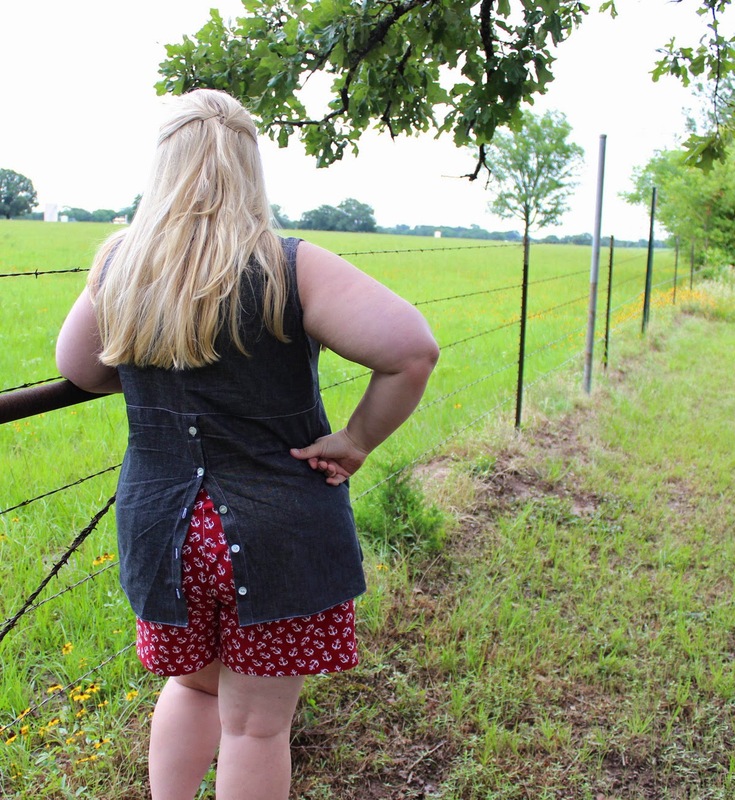 I sewed these shorts through Saturday night, intent to have patriotic attire for our World Cup viewing party in Austin. The sewing gods demanded it be so! That I already own a navy anchor print dress was, obviously, a nonissue. The construction of these shorts was pretty easy, if a bit unorthodox. I opted for the longest inseam of the three, for comfort's sake. Greenstyle provides photographs and video tutorials, along with the directions, which were super helpful in this case. The fly insertion doesn't use a fly guard and has you insert the zipper upside down, which would have been a challenge to my spatial reasoning skills, without those detailed pictures. I still somehow inserted the fly incorrectly, but it zips and looks perfectly normal. To be honest, I prefer the method in the Tap Shorts, which is a more traditional finish. Y'all know how I like to do thinks the "proper" way, after all. For a beginner, I think the Taylor method would be an easier introduction into fly zips, if not the one that should be used forever after. Other than that, the construction was super painless. Every piece fit together beautifully and all the instructions were clear. I did end up taking a bit more room out of the center back waistband and seam, in the end. The canvas has more stretch than muslin, so it was gaping back there and driving me insane! An additional 1.5 inches were taken out and things are still roomy, but more secure. I'm not sure my body type is proportioned well for low rise styles, honestly. When there is such a discrepancy between waist and hip measurements, fitting that middle area can be a beast. The next time, I may take the shorts in a bit more through the legs, just to perfect that fit. I quite like this comfy little pair, however. Wearing anchors makes me crave fireworks, hot dogs, and a bit of Sousa in the background. The only problem to deal with? 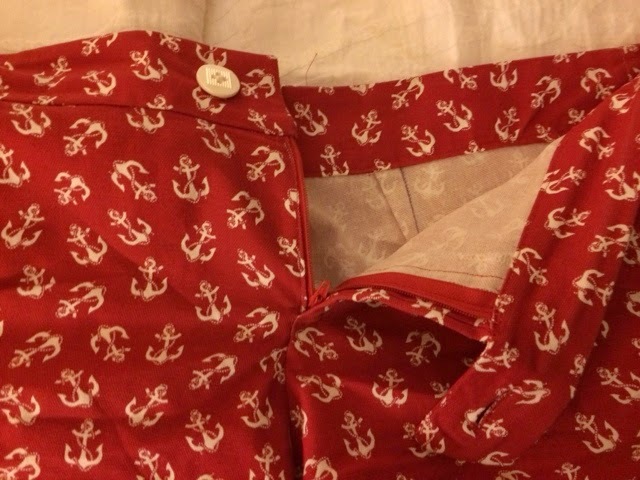 What exactly one pairs with red anchor print shorts. I opted for a simple chambray tank, using Love Notions' Hip Hop Tank. The pattern comes with a ton of variations and the option of using either wovens or stable knits, which is an interesting twist. 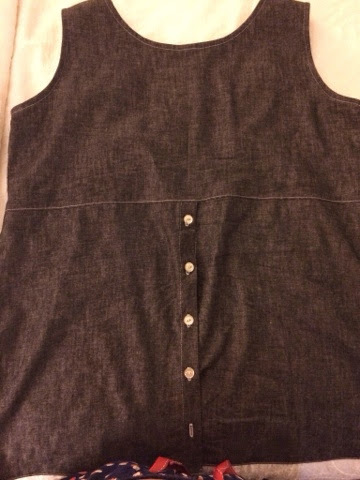 Never able to resist a button, I opted for the yoked, button-back version with a dipped hem. This was such an easy pattern that I had to add in some technical flair, just for fun. Every seam is flat-felled, with white top-stitching along the hem, neckline, and every seam. If it could be top-stitched, it was. There was a great button debate, but I ended up with simple vintage white buttons from my stash. I almost went with polka-dotted red buttons, but really wanted this to be a versatile basic. As much as I love my country, I don't wear red, white, and blue together terribly often. There really aren't that many construction details to impart. Indicative of the knit option, this is an undarted blouse. It's flowing and loose-fitting, providing a wearable summer silhouette. 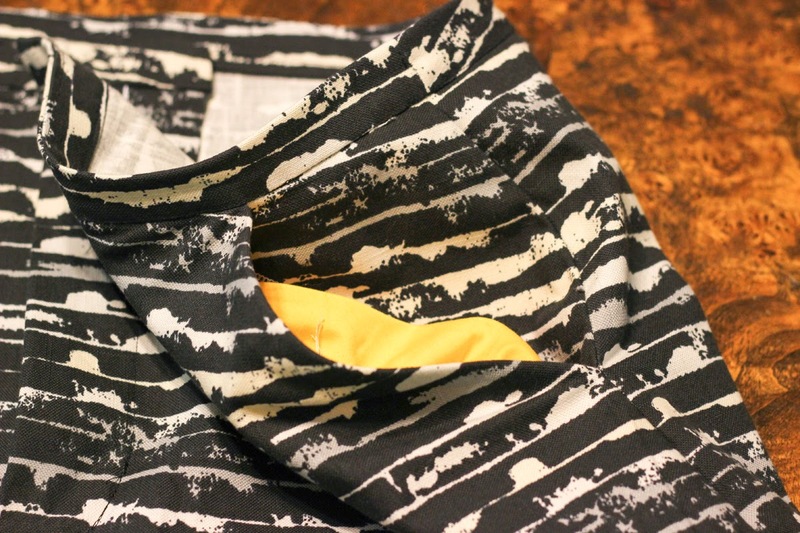 Everything is finished with bias tape, which makes it a really beginner friendly pattern. 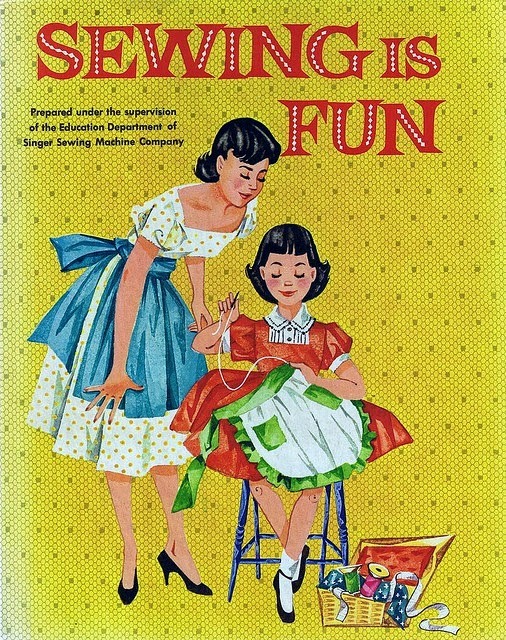 If one made the straight, unembellished version of this blouse, it would be a 1.5 hour project max. As it is, my flat felled seams and top-stitching rounded me up to 3 hours. It's funny, I didn't expect to feel one way or another about this blouse, but I ended up loving it. It's just such a cute, summery little basic. It's well-shaped, despite the lack of darting, and so comfortable. I don't own anything with a high-low hem, as I'm rather impervious to trends, but I like the rear coverage. If I were a busy parent, constantly chasing after a wee one, a million of these shirts would be in my wardrobe! As it is, I may make a few more, just for filling out the summer wardrobe. Excuse the wrinkles! 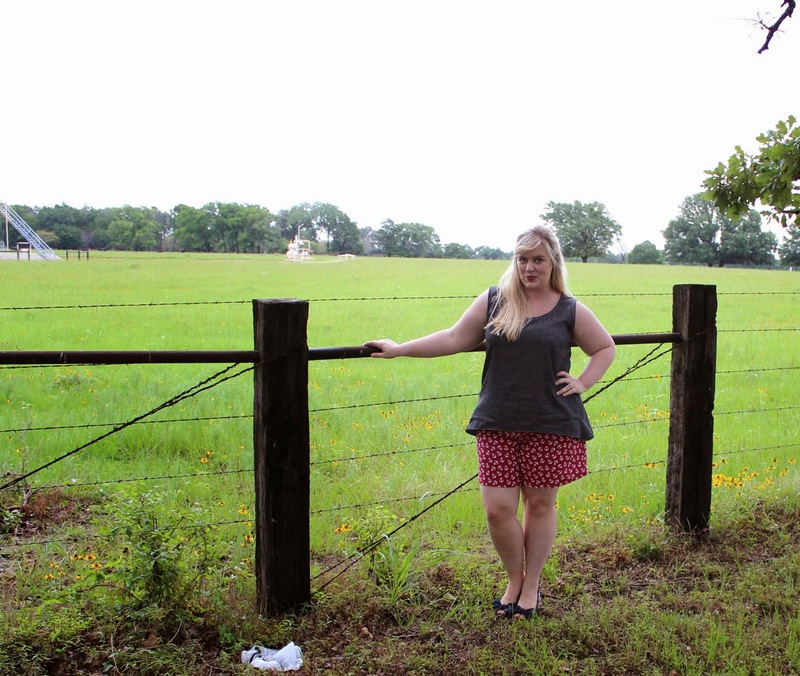 This was my second round of outfit pictures, taken next to a lovely field in East Texas earlier this week. I also decided to wear it as a cutaway back, unbuttoned, as demonstrated in the pattern images. It can be buttoned all the way, but it does lose a bit of swing! Now, let's chat about Pattern Revolution, shall we? 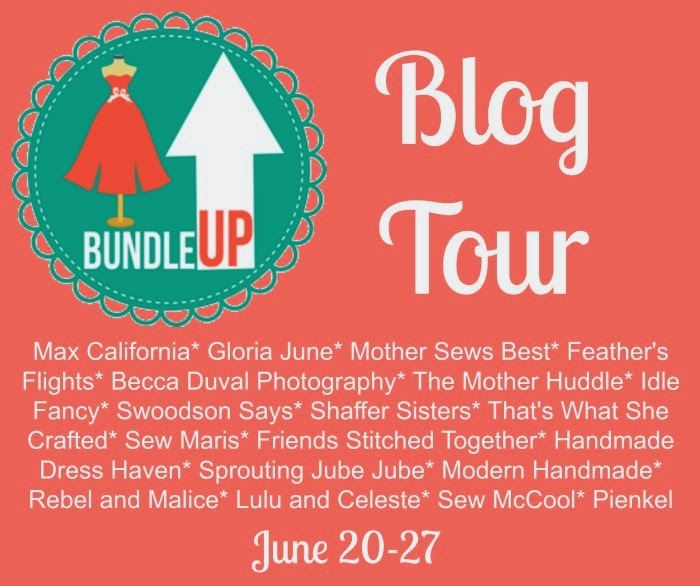 I'm so thrilled to be part of the Bundle Up! blog tour, which features so many awesome indie patterns. Until June 27th, you're able to bundle up the patterns to fill our your own summer wardrobe. If you'd like to learn more, click here! If you'd like a bit of inspiration, check out the rest of the blog tour below. 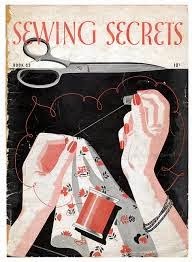 Bonsoir, my fellow sewing geeks! Today has flown by in a whirl of new appliances, tedious academic kerfuffles, and insistent family matters. It is still Wednesday, however, which means it's my day on the Betsy & Ava Blog Tour! Huzzah! The invisible zipper on Betsy #1 is no more. Cue the mourners! Grab the seam ripper! Luckily, I was four buttons away from finishing my second Betsy skirt, a nautical wrap version. It doesn't remotely go with my Ava, unfortunately, so her debut will have to wait for her partner in crime to be repaired. You can intimate from this happy coincidence, however, how much I adore this little pattern. After finishing View A during the testing, Views B and C were quick to follow along! The three views in question are a traditional pencil skirt with embellished belt loops, a buttoned wrap skirt with a narrow waistband, and a high-waisted "Pin-up" skirt with an accordion pleat at the back. As a pencil skirt junkie, I whooped with joy upon seeing these illustrations. Not only do I love a curve-hugging skirt, but Abby's patterns are consistently among my favorites. 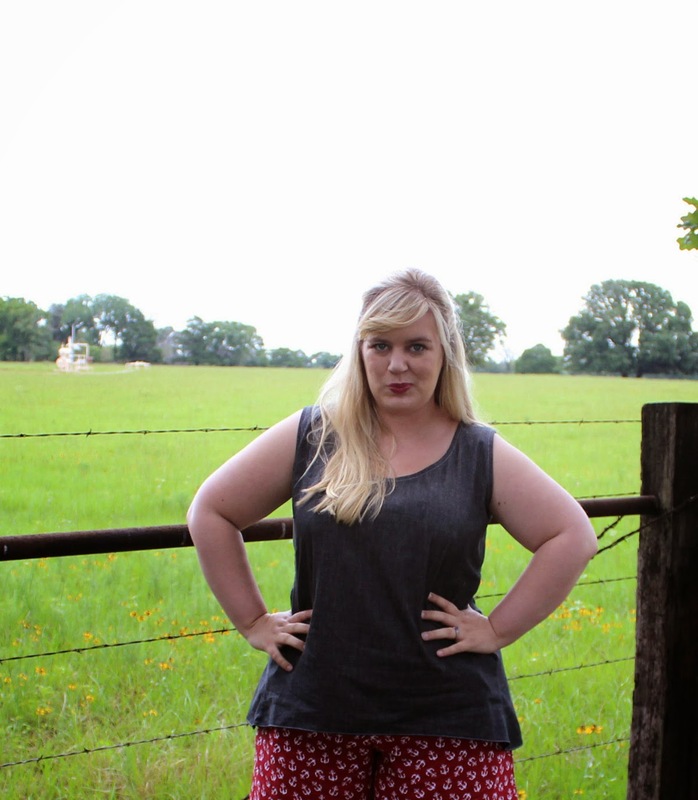 They are well-drafted, thoughtful, and have proportions that work brilliantly for my shape. Miss Betsy was destined to become just as beloved as my dear Peggy. Even better, this time around Abby has expanded her size range! 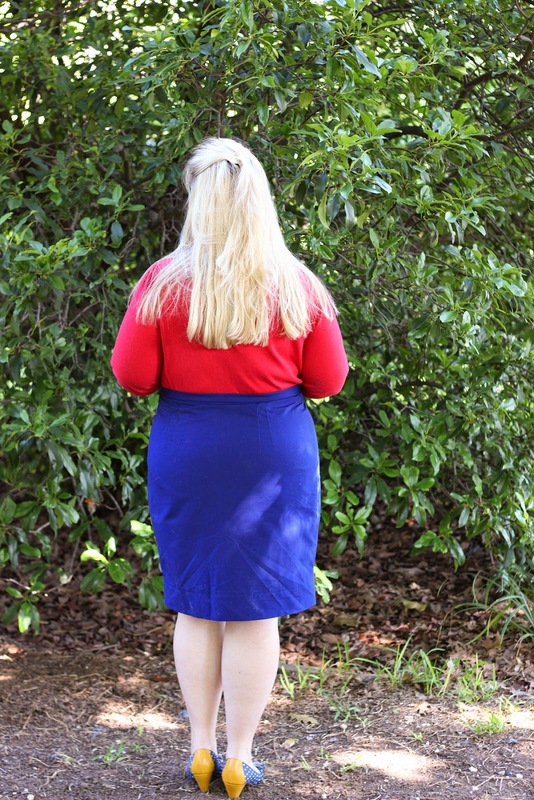 The Betsy covers every woman from a 23-inch to a 42.5 inch waist measurement, which far exceeds the current skirt offerings from Big 4 pattern companies. 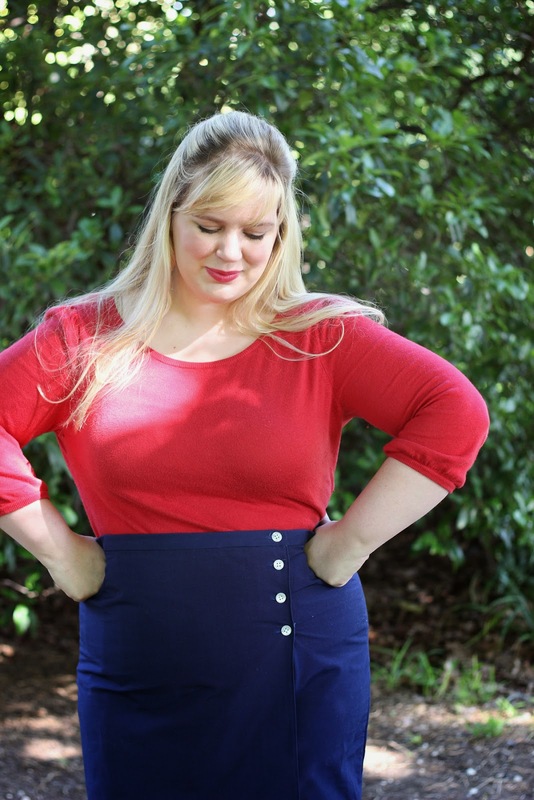 So many sewists can get in on the pencil skirt love! Let's talk construction, darlings. 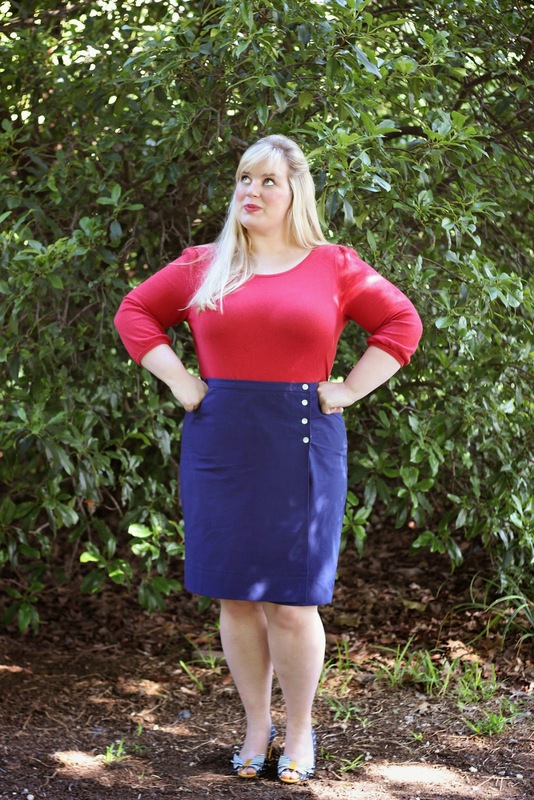 Betsy is a double-darted pencil skirt, which we ladies of the Curvy Sewing Collective have decreed to be the most flattering of designs. The extra bit of shaping provided by doubling up on darts works brilliantly, for those of us with large waist-to-hip ratios. 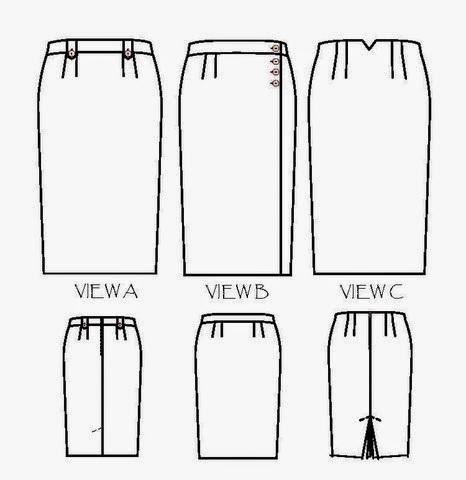 If you've ever sewn a wrap skirt, you'll be familiar with the design of this view. There are two front panels, which are sewn to the opposite side seams of the skirt back. You wrap them around you, fastening a hook and eye at the hidden side seam, then the row of buttons along the visible panel edge. Voila! An adorable skirt. On the Betsy, there is also a narrow waistband running along the top, which adds a bit of security and design interest to the skirt. The waistband construction is so novel, actually--it uses one large pattern piece, instead of the standard facing method. 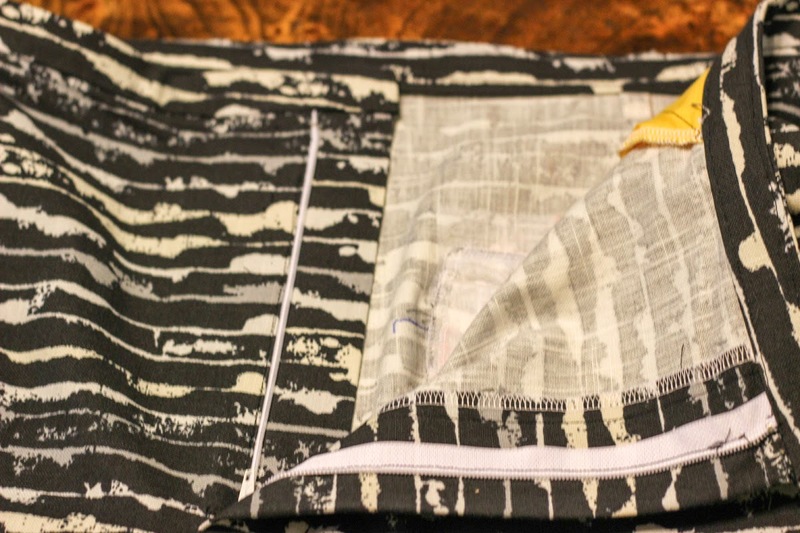 The piece is folded over twice while sewing, so that all raw edges are concealed and there are no bulky seams up top. Don't you love efficient little details like that? For this particular Betsy, I used a navy twill from JoAnn Fabrics that I'd originally sourced for my final Project Sewn look. 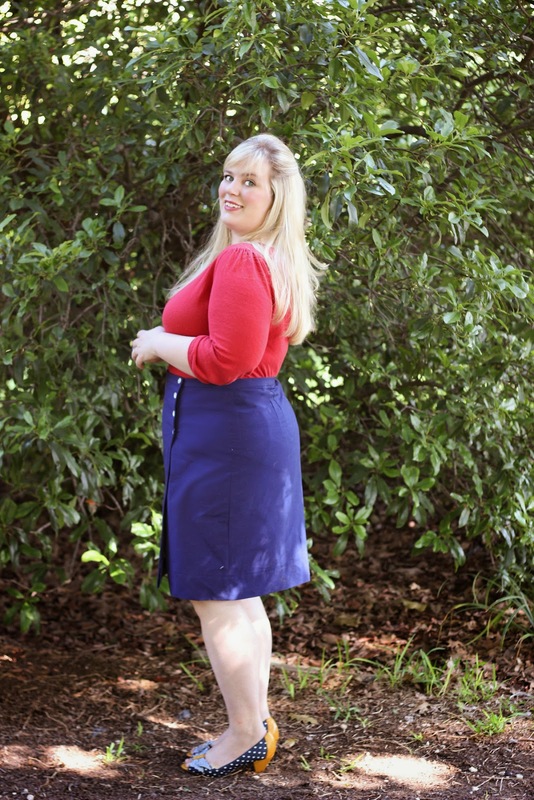 It was meant to be a blazer, but I could not stop fantasizing about a nautical-inspired wrap skirt! There's something about white buttons marching along navy that screams summer skirt to me. Maybe it's all those Ralph Lauren lookbooks I poured through in high school, but it's a pairing that makes me long for sunny days and sailboats. So, that's exactly what I made! The twill doesn't have any stretch, as the pattern calls for, so I went up a size at the hips from my first Betsy (from an AUS 18 to an AUS 20) to account for the difference. BGD patterns run with much less ease than the Big 4, so it was good decision. Even with the up sizing, it's quite a form-fitting little skirt. The seams were all sewn traditionally, then finished with my serger to prevent unraveling, which is my standard procedure. I love the speed of a serger, but I'm such a stickler about proper garment pressing. It makes me twitchy not to press the seams of woven garments open! 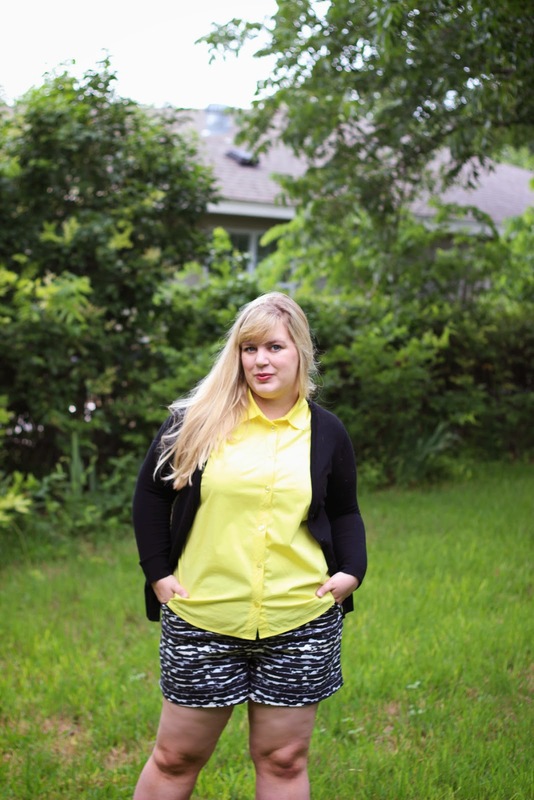 This was such an easy, fun skirt to put together. I took my time with it, as I prefer to sew in small sessions when not under deadline, but it only took a few hours total to whip up. 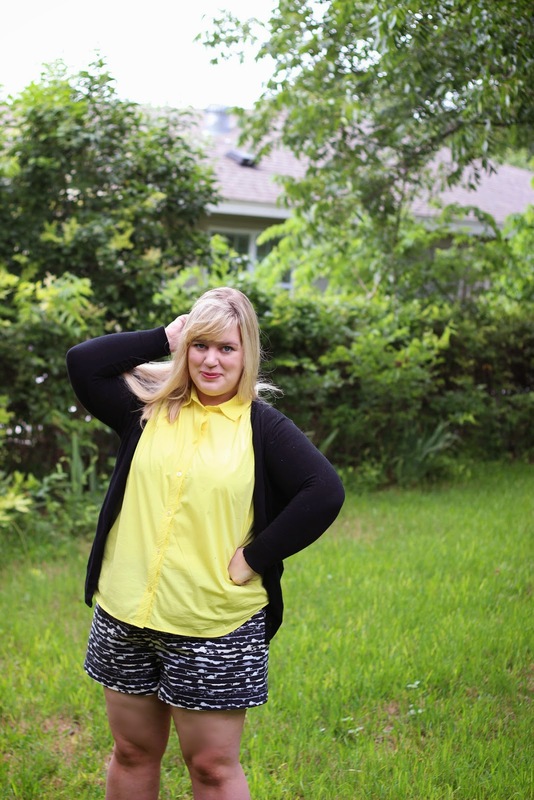 The result is a super cute wardrobe staple. It's rare that I sew with solid fabrics, but I love the simplicity of this piece. Sure, it's just a navy skirt, but with those white buttons and the right blouse, it's the perfect skirt for a lakeside adventure. You can bet I'll also be sporting it on July 4th! In addition to my currently injured initial version, I also have a large floral Betsy all cut out and ready to sew. 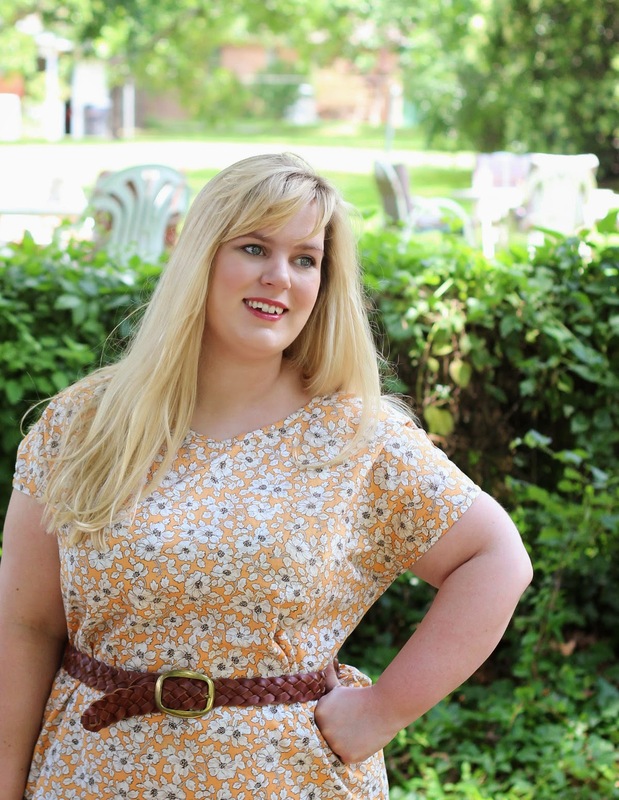 As demonstrated by the lovely Tanya, fabulous T, and adorable Mary, this pattern is ideal for large, gorgeous florals! Quite frankly, I can't imagine a print that wouldn't work for Betsy. Since pencil skirts are so conservative on yardage, they're a great opportunity to use up bold, fabulous fabrics. Knowing me, there will be quite a few loud iterations in my future. The buttons! I'll use any excuse to embellish a garment and buttons are a fabulous way to do so. These four little lovelies are from my vast, ridiculous collection of vintage buttons. I can't come away from an antique store without more buttons. The shape! Double darts ftw, y'all. The waistband! It was such an efficient, brilliant method of construction. Though intended to be a little longer in design, I took a 3.5 inch hem on this Betsy. At 5'8'', that put the skirt's hem right along my knee. Sized up to an AUS 20 at the hips, to make up for intractable fabric. Not a thing! It's a super little skirt. 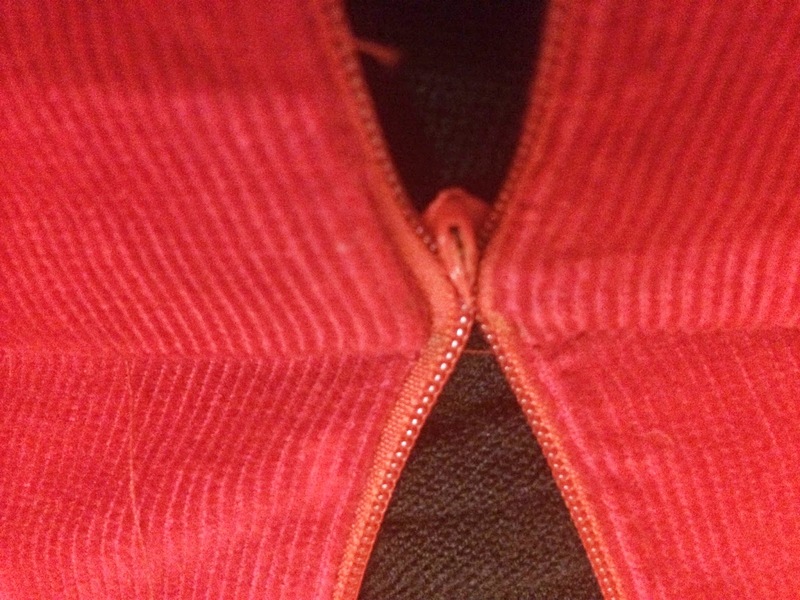 Not having to sew a zipper is amazing! Sewing a buttonhole through four layers at the waistband was bit of a trial for my machine. The fabric was quite thick and my machine is on its last legs, but it's something to be aware of, if your machine is similarly decrepit. I opted not to interface the waistband, with just such a scenario in mind. About three hours, because I was purposefully slow. 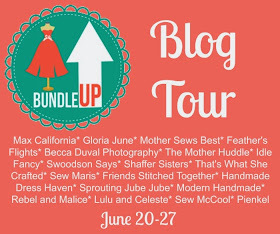 Don't forget to check out all the other lovely pieces on the Betsy & Ava Blog Tour! I'm sure I'll be back quite soon with more of both patterns. Chic wardrobe staples are the cat's (well-tailored) pajamas! Good afternoon, lovely ones! Have you heard the news yet? 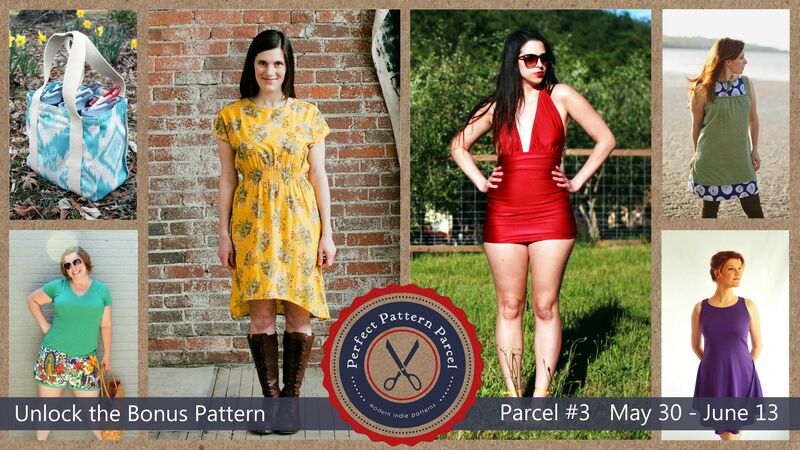 Perfect Pattern Parcel is back with their third bundle of patterns. Woohoo! As you may know, Perfect Pattern Parcel is an initiative that bundles hand-picked, independently designed patterns for two weeks only. Not only do you choose your own price for the bundle, but all post-cost profit goes toward Donors Choose, a charity which matches up the needs of educators with supportive donors. From the last two bundles combined, Perfect Pattern Parcel has raised almost $4,500 for educational charity! Impressive, right? As part of the Parcel #3 Inspiration Tour, participating bloggers were asked to make up one of these awesome patterns. 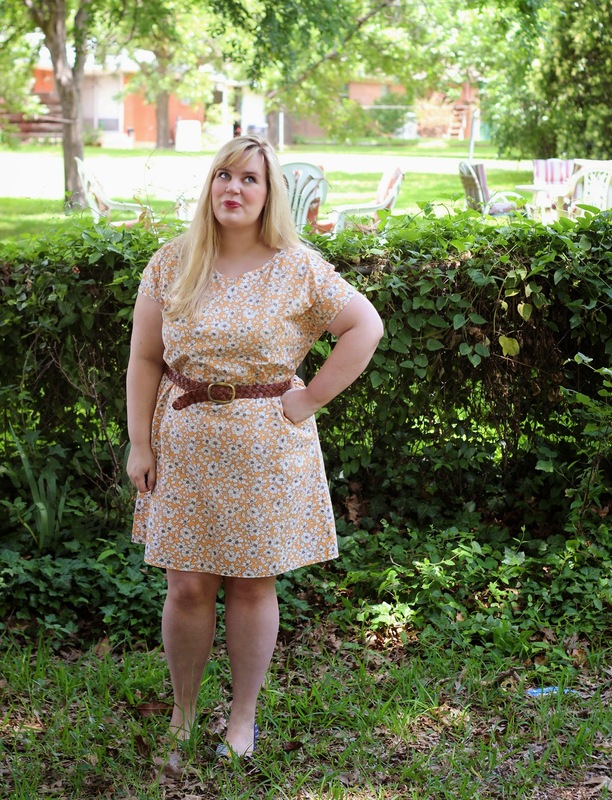 For this particular stop, I chose the Staple Dress by April Rhodes, a cute, casual basic that I've long had my eye on. 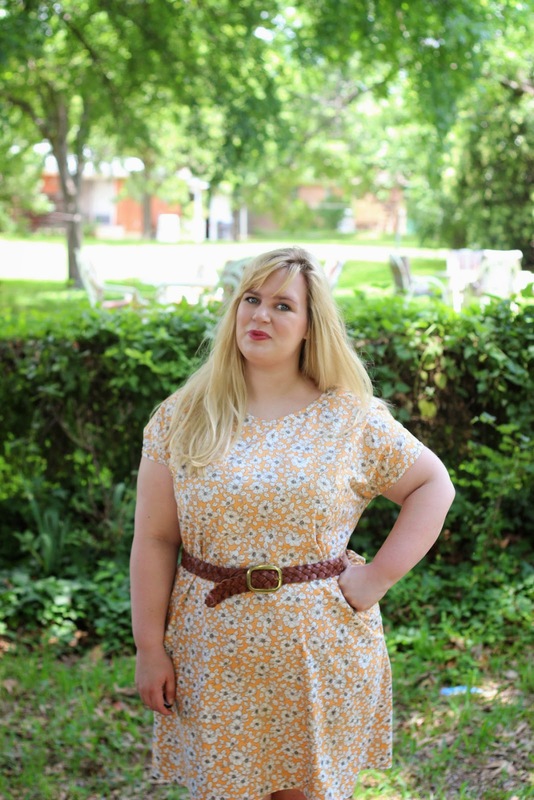 My go-to summer uniform is a comfortable cotton dress that can be easily layered, which sums up the Staple dress perfectly. It's a simple, beginner-friendly dress: two main pattern pieces, kimono sleeves, a shirred waistline for fit, and a bias bound finish. For an experienced sewist, this is about as relaxing a project as it gets! Even better? 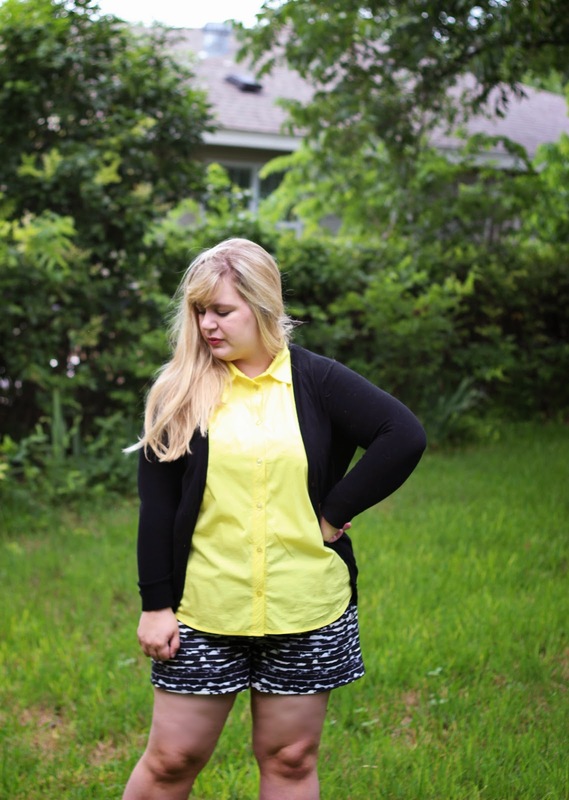 The Staple works for obscenely narrow fabric, like this vintage yellow cotton from my stash. When the 2.5 yards were cut on the fold, I just snuck out all the necessary pieces for this dress, a feat that not even Colette's Laurel could accomplish! If we're being honest here, I probably should have used a more colorful fabric for this project. 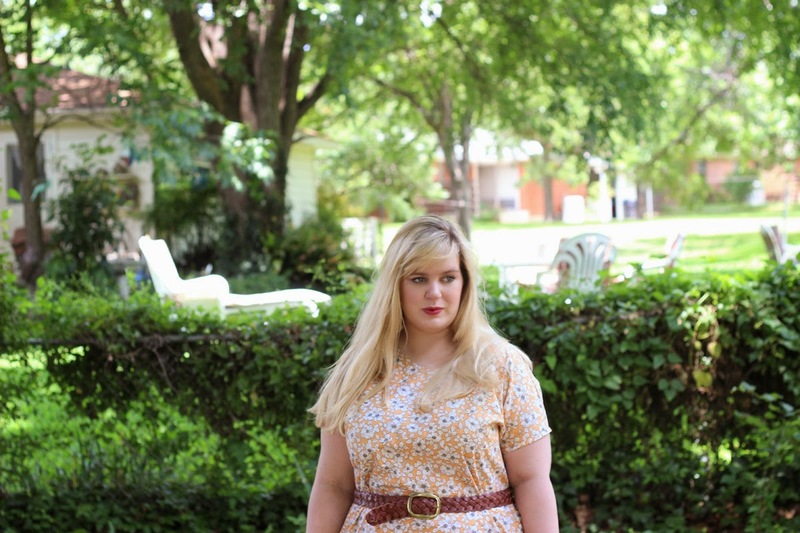 With my untanned, dissertation-induced pallor, this mustard floral does me no favors, but...I adore it, y'all. Love is blind! 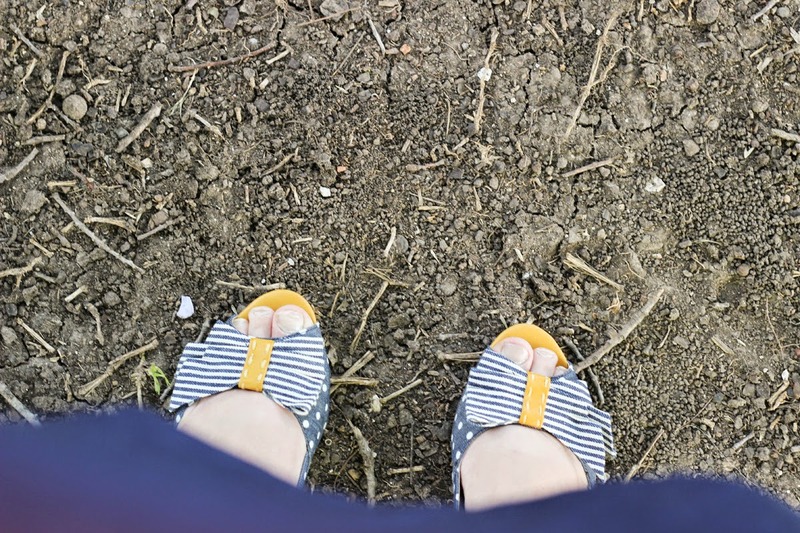 (Probably from looking at my legs) Yellow, especially the earthy, darker side of its spectrum, has long been my favorite color. Add in a line-drawn cream floral on top of that? I never stood a chance against this fabric. Finding a pattern that could finally make full use of it was such a happy circumstance. Perhaps, despite my crazed sunscreen routine and indoor schedule, I will tan this summer and be able to pull it off better? Anything can happen. Or not. I still love it! I would be lying if I claimed not be hesitant about the Staple's lack of traditional shaping. For those with hourglass figures or prominent bustlines, it's all too easy to be lost in a sea of fabric, when clothes aren't well structured. There is a reason I make so many fit-and-flare dresses, after all. Honestly, I needn't have worried. Not only is the Staple cleverly designed--with natural waist curves and a cute A-line skirt--but the shirring does wonders for its shape. It's a blousy look, of course, but one that fits with the relaxed feeling of a summer's afternoon. The kimono sleeves give a great range of movement and the shirred waistline moves really well with my body. Simplicity of design works wonderfully in this dress. This is the perfect pattern for running errands or going on a picnic, while staying cool and comfortable. Can't you just imagine it made up in a cozy, breathable linen? I'm having romantic visions of Kathleen Turner in Romancing the Stone...without all the gunfire. As for the Staple's construction itself, this was one of the easiest projects I've ever sewn. Though the pattern calls for French seams at the shoulders, I opted to serge all the seams, which also made it an extraordinarily quick project. Cut-to-hem, this dress took about 2 hours to put together. Woohoo! 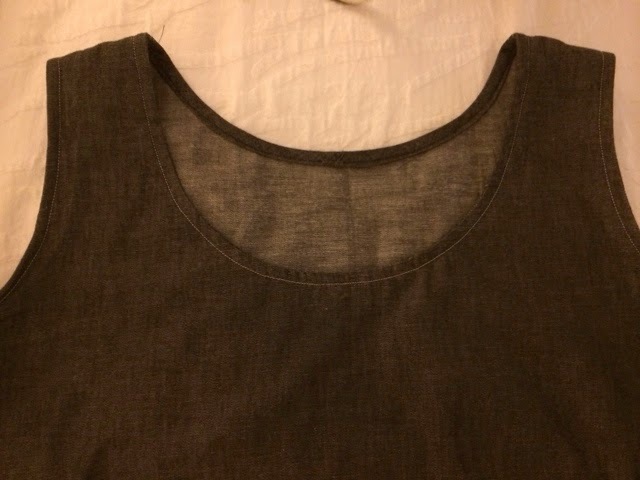 The neckline and the sleeves are finished with what's called a facing, but is actually just self-fabric bias tape. Instead of turning those "facings" to the inside as instructed, I turned them to the outside, in an exposed bias finish. For such a heavy floral, anything to delineate the edges is a good idea. I considered using a different color, but neither cream nor the brown of the floral lines really worked for me. Since the Staple dress is so layerable, I didn't want to give it a seasonal feel with the finish. This dress is going to be awesome with boots and tights! When it came to fitting, the Staple's blousy cut was super forgiving. I used an XL, graded out just a little at the bustline, then back to the XL at the waist and hips. It worked beautifully. The resulting dress is loose, but not baggy. I could totally rescue my sister from Colombian jewel hunters in this dress! That's always a victory. So, that's the Staple Dress! 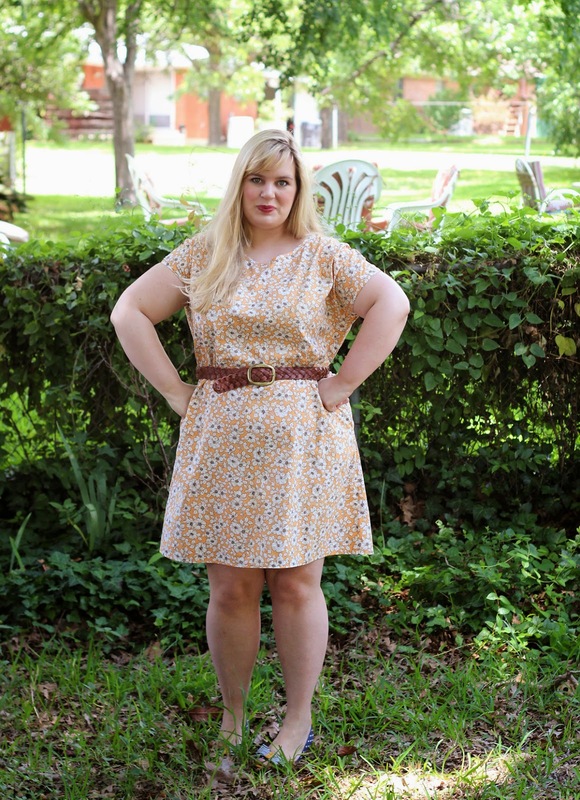 If you're a beginner, looking for an easy, satisfying dress to conquer, I can't recommend this pattern enough. I'm already planning another one, in a flowy blue rayon, which sounds ideal for this steamy Texas weather. If you are interested in the Staple Dress and all the other great patterns in Pattern Parcel #3, the sale will be on for another eleven days. Check out all the other great inspiration posts below, pick your price point, then get to sewing! Not only will you be supporting independent designers, but helping out education, as well. Is there any better excuse for new patterns? I think not.